These instructions are for 40RP, 40RW, 45 and 55 rope start models. Install this kit first, then install the Emergency Ignition Stop Switch Kit following instructions provided with kit. When replacement parts are required, use genuine Evinrude/Johnson parts or parts with equivalent characteristics including type, strength and material. Failure to do so may result in product malfunction and possible injury to the operator or passengers. Remove cover mounting screws (A) and lay cover aside. Remove and save stop switch ring terminal mounting screw (B) and star washer. Separate Amphenol connectors. push black wire socket terminal out of plug. Remove and discard screws from the throttle cable lever (C) and anchor (D). Remove and discard pivot (E), jam nut (F), anchor (G) from throttle cable. Remove and lay aside throttle cam to allow clearance for cutting manifold. Observe position of washers for reassembly. Remove and discard detent spring and mounting screw (H). Lay shop towel in lower engine cover to catch aluminum chips. Cut off intake manifold mounting boss flush with throttle cam mounting surface. Remove and discard shift handle shoulder screw (I) and washers. Remove and discard steering handle locknuts and mounting screws (J). Support handle and pull electrical cable and throttle cable through lower engine cover. Remove grommet from cable and reinstall in engine cover. Discard handle assembly. Loosen steering friction adjustment screw (K) to allow motor to steer freely. INTERLOCK MODELS: Remove and discard starter lockout cable anchor screw from lower engine cove bracket. Disengage cable from cam. Observe position of square plates for reassembly. ALL MODELS: Raise shift rod to a vertical position. Remove and discard cotter pin, washers & shift rod. Remove and discard throttle lever cotter pin (A). Save washers and bushing. Remove and save throttle lever shoulder screw (B) and washers. Observe position of washers for reassembly. Measure and record wide open throttle stop screw position in throttle lever for assembly in new lever. Remove bumper, jam nut, and throttle stop screw. Discard throttle lever. Apply Triple-Guard® grease to all shoulder bolts, pins, and bushings. Loosen carburetor mounting nuts. 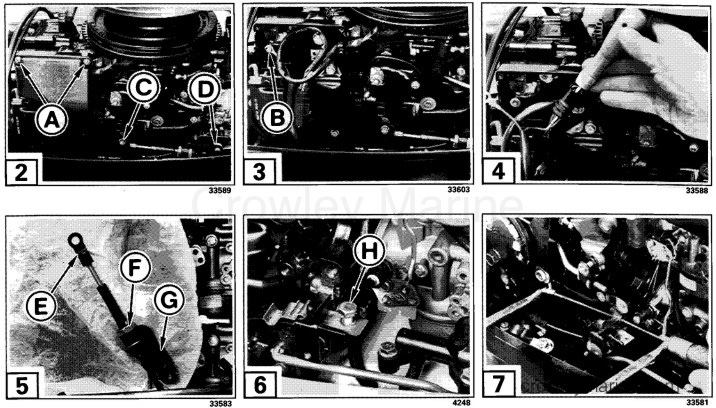 pull carburetors forward to clear lower anchor block mounting screw. Position anchor block (23) on manifold. Install screw (22) in lower mounting hole. Hold screw in position with a flat blade screwdriver and turn screw with an open end wrench. Rotate anchor block in position and install screw (12). Tighten screws securely and retighten carburetor mounting nuts. Position shift lever link (2) on shift lever & bushing (1) with hole (A) FORWARD as shown for lockout cable. Install pin (3), washer (4) and cotter pin (5) in bushing. 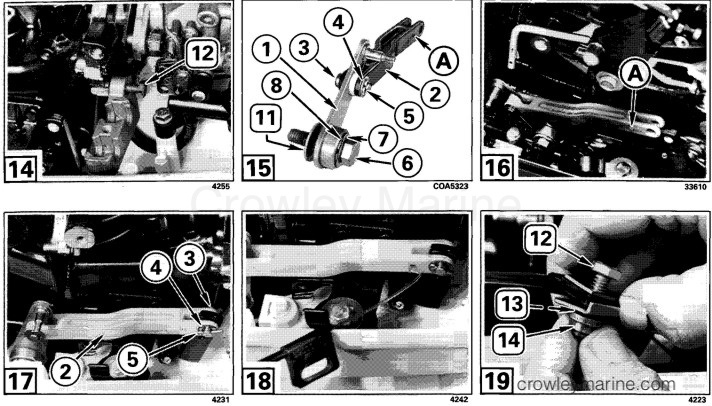 Install bushing (8), shoulder bolt (6), wave washer (7), and flat washer (11). Secure shift lever to powerhead with shoulder bolt. Tighten shoulder bolt securely. Align link with shift lever. Install pin (3) thru link (2), bushing (in lever), and washer (4). Secure with cotter pin (5). INTERLOCK MODELS: Insert lockout cable in hole in link. Align tabs with lockout cable anchor. Insert screw (12), washer (13), and spacer (14). Install screw into lower motor cover support. Tighten to a torque of 60-80 in. lbs. (7-9 Nm). ALL MODELS: Reinstall throttle cam pivot screw with washers and bushing in correction location. Tighten pivot screw to a torque of 60-80 in. lbs. (7-9 Nm). Assemble wide open throttle stop screw (A), jam nut and bumper onto new throttle lever (15) at predetermined dimension. 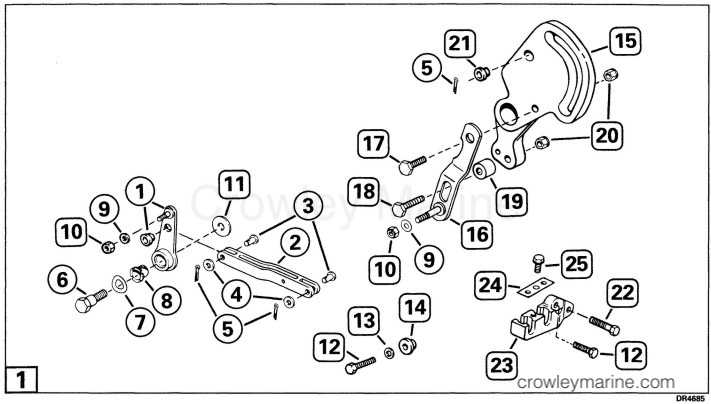 Install throttle lever bracket (16) onto throttle lever using screw (17), screw (18), spacer (19) & locknuts (20). Insert bushing (21) in throttle lever. Insert throttle link through throttle lever with original washers on each side. Secure throttle link with cotter pin (5). Reinstall old shoulder screw, flat washers, and throttle lever. Tighten screw securely. Make sure throttle lever operates smoothly and does not bind. Install Emergency Ignition Stop Switch Kit following the instructions provided with kit. Check spark/throttle synchronization, wide open throttle position, and spark advance. For procedures. refer to Service Manual. Apply Triple-Guard grease to throttle and shift cables. Install control cables onto shift and throttle levers and secure with washers (9) and locknuts (10) provided. Do not substitute. Adjust control cables. For procedure refer to Service Manual. Secure control cables with retainer (24) and mounting screw (25). Protrusions must face DOWN. Tighten mounting screw to a torque of 60-80 in. lbs. (7-9 Nm). Connect wires for the emergency ignition stop switch following the instructions provided in kit. After installation is completed, check for interference between wires and engine linkage parts. Undetected interference may result in electrical wires being damaged. Install electrical bracket cover. INTERLOCK MODELS: Check starter lockout adjustment. Make sure starter does not operate when engine is in gear. For procedure, refer to Service Manual.